Channel 9 News reported on the sentence hearing of Alexander Villaluna yesterday. He pleaded guilty to murder and grievous bodily harm after he attacked Keith Collins and Jovi Pilapil with a hunting knife. Collins was killed in the attack and Pilapil was stabbed in the chest and arm. The quote in Channel 9’s headline was from Villaluna’s statement to the court for his sentencing hearing. It’s an accurate quote and it probably does reflect his view of his crime. 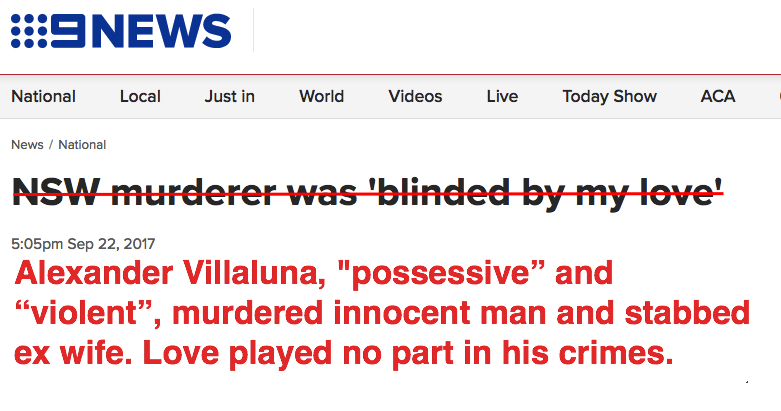 But why is the media affirming a violent, controlling murderer’s view of the crime he committed? This is not an impartial or objective headline. It’s an endorsement of a murderer’s self-justification for taking an innocent life. Murder is the ultimate violation and it has nothing to do with love. Love is Keith Collin’s broken hearted children who had to identify his body, mourn his unjustifiable loss and carry on their lives knowing he should have been there to watch them get married, have children and share all their joys and sorrows. He was only 53, he should have had decades to experience love. Promoting a murderer’s delusions of love is an unconscionable act in the face of the grief Keith Collin’s family are carrying. And it callously disregards the horror Jovi Piapil has to live with after being brutally stabbed and having to watch a man die on what should have been nothing more than a fun first date. It’s also worth mentioning that no references to sources of assistance were listed at the end of an article about domestic violence, despite the strong recommendation in the press council guidelines on reporting domestic violence cases.